HA NOI (VNS) — A programme to help farmers distinguish genuine products from fake, copycat and substandard ones is rolling out across the country. Fertiliser makers interviewed by danviet.vn contributed their ideas on how to make it work. The Programme for Coordinated Monitoring of Law Compliance in Production and Trade of Agricultural Material Inputs 2014 – 2020, was instituted in order to supervise the use of fertilisers, plant protection chemicals, veterinary medicines, feed, plant seeds and seedlings. Initiated on July 17, 2014 (thus referred to as Programme 17) jointly by the Viet Nam Farmers' Union, Viet Nam Fatherland Front, Ministry of Agriculture and Rural Development and Ministry of Industry and Trade, has seen 35 provinces sign up for the programme so far. Nguyen Hac Thuy, vice president of Viet Nam Fertiliser Association, said he was very supportive of the programme because fake and copycat fertilisers had become a mounting challenge. Estimated damages were annually around US$2 billion in recent years. Le Xuan Cuong, director of Cuong Lien Agricultural Materials Co., Ltd in Thai Binh Province, also supports the programme but worries about whether monitoring would be strict and fair. He claimed that some cooperatives and socio-political organisations are involved in making fertilisers but had come under less inspection and audits than other businesses. Cuong suggested that those businesses found to comply with the law should be promoted in social media so that customers can, "find their way to them". Pham Manh Ninh, CEO of the Ninh Binh Phosphorous Fertiliser Company in Ninh Binh Province, recommended that producers of fake and substandard products should be named publicly and punished. He claimed that the local government's management of fertilisers was being "localised," which he explained meant that local producers and sellers of fertilisers were invariably given priority over those moving into a locality for new business. He also said that the process of taking samples for testing was discriminatory and failed to reflect true product quality. He proposed a bonus and punishment scheme for people in charge of checking fertilisers – a bonus to those who discover fake or copycat goods and punishment for those who fail to report violations. 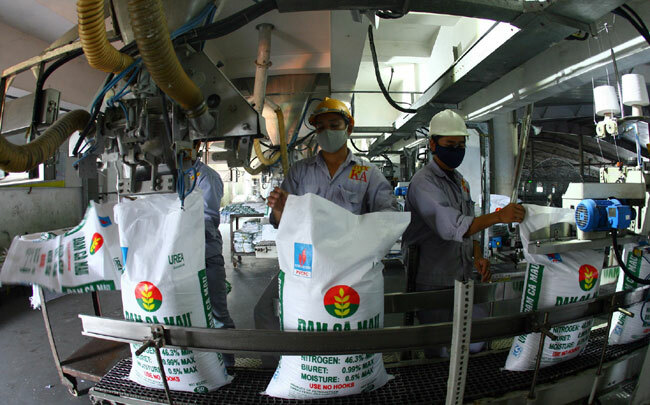 Another fertiliser maker, Hoang Van Tai, CEO of Van Dien Fused Magnesium Phosphate Company (VAFCO), said that a legal framework and a good method for monitoring would be found in the details. The programme should not only cover licensing procedures and production of fertilisers, but also the inspectors and the people who create and revise the legal framework. Tai added that the job of monitoring should be given to people who are professional, unbiased and truly capable of performing the job. Vu Xuan Hong, deputy general director of Lam Thao Fertilisers and Chemicals JSC, suggested that businesses cooperate with authorised agencies to work out measures to protect their trademarks. He also suggested that regularly organised workshops and meetings involve farmers to educate them on how to recognise genuine products and avoid fake, copycat or substandard ones. There are currently about 500 producers of fertilisers producing over 8 million tonnes of fertilisers a year.